J, K, and L are green; T and U are red; X, Y, and Z are pink. The green benches stand next to one another along the park’s perimeter. The pink benches stand next to one another along the park’s perimeter. No green bench stands next to a pink bench. The bench on the southeast corner is T.
J stands at the center of the park’s north side. If T stands next to X, then T does not also stand next to L.
Which one of the following benches could be on the northeast corner of the park? The bench on the northwest corner is pink. The bench on the northeast corner is green. The bench on the southwest corner is pink. The middle bench on the east side of the park is green. The middle bench on the west side of the park is pink. Which one of the following benches must be next to J? For which one of the following benches are there two and no more than two locations either one of which could be the location the bench occupies? If Z is directly north of Y, which one of the following statements must be true? 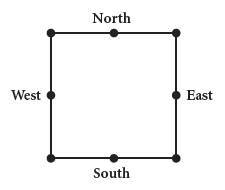 J is directly west of K.
K is directly east of U.
U is directly north of X.
X is directly south of J. Z is directly south of J. If Y is in the middle of the west side of the park, then the two benches in which one of the following pairs CANNOT be two of the corner benches? 1) Which benches must, cannot, or can be placed in a certain location? 2) What is the relationship of each bench color to the other colors in terms of placement? 5) places T in the lower right corner. Draw T there, and cross T off the master roster. 6) In the same way, we can place J where the rule indicates, right at the printed word “North.” Cross J off the roster too. 2) tells us that J, K, and L all stand adjacent to each other. Now that we have seen that J stands in the middle of the north edge, we know that K and L will stand nearby. But where? Too early to tell. Keep in mind, though, the JKL relationship. 3) is similar to Rule 2: The pink benches, namely X, Y, and Z, also have to be placed in three adjacent slots; though, again, we cannot know in what order. 4) is key. The green and pink benches can’t stand next to each other. So our 3 greens in a row cannot stand next to our 3 pinks in a row. What’s going to separate them? Has to be the red ones, no? In other words, we’re going to have to have a red bench, the three greens, then the other red, then the three pinks. There’s no other way. Check it out. Check out, too, how sometimes one is moved to proceed into Step 4 of the Kaplan Method before Step 3 (the work with the individual rules) is done. 7) doesn’t help us very much, being highly conditional. If T and X are adjacent, then we cannot have T adjacent to L. Beyond that, we ought to think through and jot down the contrapositive (If we ever see TL, then we cannot have TX) and leave it go until it has to be brought into play. For now, there’s more to be done in Step 4. We’ve seen that the red benches will be needed to separate our consecutive green and pink benches. Now we need to recall that one of those two red benches, T, stands in the southeast corner. It follows that to the left of ‘t’ will be one of our consecutive trios, either the greens or pinks, and to the right, the other consecutive trio. This leaves the northwest corner open, and one and only one red bench to fill it. It’s a huge deduction that bench U must stand in the northwest corner, and hopefully this was the deduction you made and incorporated right into the picture on the page. Our sketch makes clear that one of the two green benches K or L has to stand in the northeast corner. They chose the latter for correct choice (E). (A), (B), (C) As we deduced above and represented in the Final Visualization, these three pink benches have to occupy the bottom left corner of the square. (D) Rule 5 requires us to place T at the southeast corner. Since the four wrong choices are positively-true statements, it follows that the correct answer is either downright false, or only possibly true. We get the former in correct choice (A): As we deduced above, the bench in the northwest corner is red bench U. (B), (D) Yes, each of these benches is green: K and L in either order. (C), (E) Yes, these two benches, along with the middle bench on the south side, are all pink benches X, Y, and Z in some order. Ka-ching! The sketch instantly reveals our Big Deduction that U, in the northwest corner, stands next to J. Either K (A) or L (B) must stand on the other side of J in the northeast corner, but we cannot tell which. And T (C) and X (E) are safely separated from J. Reading comprehension is the key here. We are asked for a bench that has exactly two possible locations: not one, as T (B) has, or three, as X, Y, and Z have (C), (D), and (E). As we’ve seen in the setup and again in Q. 1, K and L will occupy the two spots between J and T on the east side of the park, but we can’t be sure which stands where. And as with Q. 1, either K or L could’ve been chosen as the answer; this time they happen to have chosen K for correct choice (A). Before you draw anything, take a look at the master sketch with this question’s if-clause in mind. We see where the three pink benches are: the southwest corner, and the spots on either side of it. How, then, can pink Z stand directly north of pink Y? Only one way: if Y stands at the southwest corner, and Z stands right above it. This leaves X for the middle of the south row, next to T...and if we are keeping an eye on the choices, we see that (D) is true. As the bench in the middle of the south row, X is in fact due south of J, the bench in the middle of the north row. (A) No, J is northwest of K.
(B) No, K is southeast of U. (C) No, U is northwest of X. (E) No, Z is southwest of J.
We’re looking for a pair of benches that CANNOT stand in the corners, and notice that the only rule still up in the air is the last one. The big insight here is realizing that one of the choices must force a violation of Rule 7. And (B) certainly would: If Z and K are in the southwest and northeast corners, respectively, then we are left with X and L standing next to T—which is specifically prohibited by Rule 7.